A GROUP of complete strangers from Brisbane have become the lifeline for a refugee family of seven who escaped their war-ravaged country three years ago. Fifteen-year-old Salim, his mother and five siblings left their home country of Somalia, which has been marred by an ongoing civil war, and arrived in Australia as refugees in what Salim said was a search for a better future. “We came here to have a better life, better education,” he said. They have slowly achieved their dreams with the help of five strangers who have become as close as family in the past three years. The group are members of the St Vincent de Paul Society Queensland’s Volunteer Refugee Tutoring and Community Support program (VoRTCS). The program is an example of the charity organisation’s approach of providing “a hand up rather than a hand out” to those who need help. The group meets with Salim and his family each Wednesday to teach English, assist with homework and assignments, and explain particular aspects of Australian culture. Tutors in the program receive training before being paired up with refugee families across Brisbane. Griffith University editor Gillian Warry first heard about the program at the Powerhouse museum, which was displaying photos of a similar program in Victoria. When VoRTCS started in Queensland, she immediately signed up, becoming one of the state’s earliest tutors. She has supported four families in 12 years, including Salim’s family, and spoke fondly of her first family, who were refugees from Afghanistan and flourished under the VoRTCS program. “The Afghani family that I started off with, who were all at school, one of them is now a lawyer working with the Human Rights Association, one of them is a traffic engineer and one of them is a psychologist,” she said. 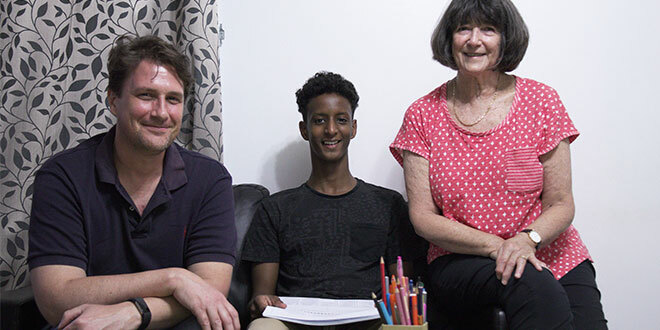 For young Salim, the VoRTCS tutors have also helped his family achieve positive growth, independence, and helped them feel welcome and comfortable in Australia. His eldest sister completed high school with a certificate in pathology, and last month his older brother graduated high school and was offered an apprenticeship. These achievements would have been mere dreams three years ago. “VoRTCS is important because as refugees, who are just fresh to Australia, we’re not really comfortable about going around (as) we can be shy,” Salim said. Salim’s other tutor Trish McGrath said VoRTCS groups across Brisbane were meeting hubs of peace. “People basically do want peace, and in little ways each of these VoRTCS groups build up peace in our world,” she said. That message is needed now more than ever, as an influx of refugees into Brisbane means more tutors are needed in the program. “VoRTCS tutors do not need to have any particular background, experience or qualification,” Mrs McGrath said. To find out more or to volunteer with VoRTCS, visit their official website refugeetutoring.org.